For a new take on luxury, finance a new 2019 Mercedes-Benz GLC. This new Mercedes-Benz SUV is perfect for those who prefer the finer things in life, as it comes furnished with hand-crafted stylings, unique accents and refined comforts. 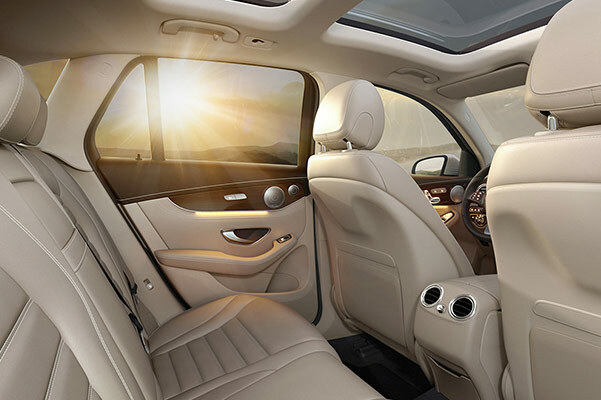 The 2019 Mercedes-Benz GLC also comes equipped with a wide array of Mercedes-Benz interior features in addition to turbocharged performance that’s ideal for those who love to be behind the wheel. Interested in learning more about the 2019 Mercedes-Benz GLC 300 or 2019 Mercedes-Benz GLC 350e 4MATIC®? Test-drive the 2019 GLC at our Mercedes-Benz dealership in Omaha, NE. With a myriad of interior perks and driver-assistive technologies, it’s no wonder Nebraska drivers have turned to the 2019 Mercedes-Benz GLC. See how the 2019 GLC distances itself from the competition when you schedule a test-drive at Mercedes-Benz of Omaha and learn more about your Mercedes-Benz lease and loan options!